I have made 8 more thread catchers, still following this same tutorial as the first time I made them. Yes, I know there are only 6 in this picture. Two have already been given away. I'm using one and the other 5 are just being held until I have other occasions to give them away. So my new one will sit by my machine, and hopefully stay open, making it easier to dispose of thread tails and the like. I must say, after using the red one for almost a year now, I'm amazed at just how much thread it holds. I'm also amazed that my post from April, when I accidentally made 3 of them, is my fifth most popular post. 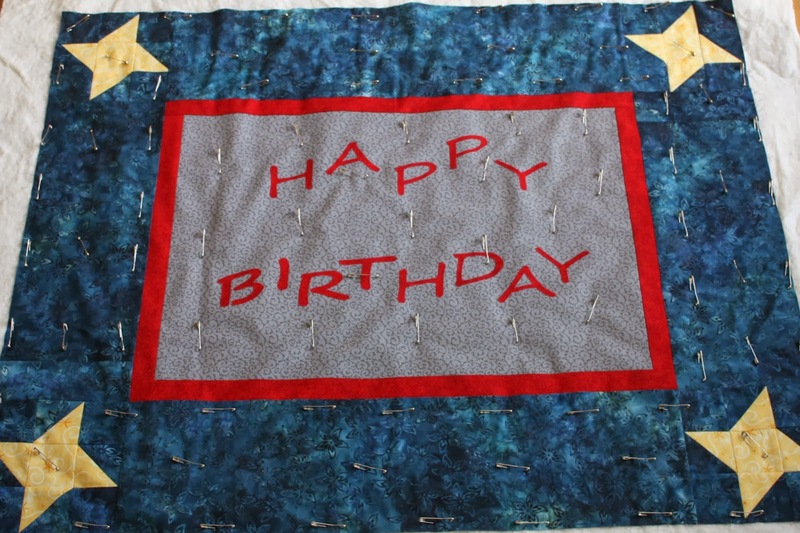 In other news, my happy birthday quilt is sporting some new hardware. I'm still looking for testers for the pattern, so if you're interested please let me know. The Compassion Bloggers trip to Uganda is almost over. Go here to read their blog posts about the trip. Interested in sponsoring a child? Go here to help release a child from poverty in Jesus' name. Have a great weekend! I'm linking up with all the Friday finish parties. Oh, those are fantastic! Another little project on the list! Thanks for sharing! Interesting construction of that catcher. Thanks for sharing. I pinned that pattern ages ago -- thanks for reminding me that I wanted to make one! Great work with the thread catchers, you are a busy lady!